What can fractional lasers do? Palomar's Starlux Fractional laser Lux 1540, is an non-ablative laser (= which does not pierce nor remove any skin), which provides great results with a variety of skin issues, such as wrinkles, stretch marks, acne or surgical scars, and sun-related/hormonal pigmented lesions (melasma). It improves complexion and tightens skin. It resurfaces the skin, by ridding you of lesions, improving and smoothing complexion, and adds firmness and tightening to the whole face. Non ablative fractional treatments are very interesting in that results are long-lasting. If you are not inclined to have injections (hyaluronic acid fillers, botox injections) which need to be repeated regularly, this laser treatment is ideal for you. It operates on the principle of "micro-coagulation" and allows repair ofdeep wrinkles or scars. During the flash , the laser sends hundreds of microscopic areas of coagulation in the skin. A healing process is initiated, and nee tissue appears (smoother, less marked). Unlike CO2 lasers, peels or abrasive lasers, this technique does not harm or remove the skin superficially. The fractional laser simply forces the skin to renew itself in depth, without altering the surface. This process enables effective long-term results and much faster healing than other lasers. The biggest advantage of this laser is that it is fractioned, thus only a portion of the area treated is forced into micro-coagulation at a time, enabling better and faster healing, fewer side effects, no risk of infection, and conservation of most of the melanocytes, thus avoiding accidental skin depigmentation. 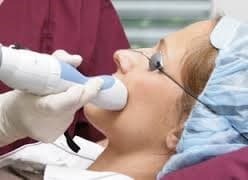 Lux 1540 treatments are very safe and effective, but only when in the hands of medical professionals specifically trained for this technique. Patients appreciate these treatments, which have few side effets and long-lasting results. As results evolve and improve from one session to another, the number of laser treatments to achieve full recovery depends on lesions' depth and age. Each session brings reduction in both size and aspect of wrinkles, stretch marks or scars. Effects are stable, since deep cells are renewed entirely, skin achieves hydration, smoothing, uniformity and firmness. A fractional laser treatment lasts a really long time. Lesions (scars, deep wrinkles, melasma, stretch marks) disappear for ever. Naturally, new wrinkles may appear after a few years but these will be less visible and much less deep, as your initial laser treatment effectively delayed normal skin aging. After a few years, if you wish to maintain your results, another fractional treatment can be undertaken with no risk to your skin. As a precaution, laser treatments are not made during pregnancy. Laser treatments are not adquate in the presence of potentially cancerous lesions. These treatments are never undertaken in Summer (sun exposure banned during the treatment). A factional laser session lasts approximately 30 minutes, depending on the purpose of the treatment. Make-up must be perfectly removed prior to treatment, to avoid pigment transfer to the skin, and will only be authorised 8 hours after session. Whilst you are made comfortable on a medical bed, the laser technician will place your eye protections. There is no light passing through a fractional laser, but eye goggles are nonetheless a necessity with lasers of this category and power. After a few tests to ensure your skin’s good response to the treatment and your comfort, the laser technician will start the session, adapting as needed power, pulse count, overlap and repetitions. There is no point in having a local anesthesia prior to treatment, since the effect of the treatment takes place below the skin, not at its surface, and continues for a few days, so anesthesia is of no use. Besides, the passage of the laser is not painful. What you do feel during each flash is like a small needle prick or tingling. Each laser’s impulsion is brief and intense, inducing local thermo-coagulation. It’s that thermo-coagulation which induces warmth and redness, sometimes a short-term puffiness. On the surface, your skin is not burned nor broken, it’s inside that the real work is happening. The laser technician will enquire throughout the session about your well-being, and will place a « cold-pack » to ice the area, which helps to subside much of the swelling and provides immediate comfort. Micro-swelling and/or redness is expected immediately post-treatment. It is proof of the thermo-coagulation process. Residual redness or marks may remain for 1-3 days (or weeks when treating body stretch marks or deep scars), which will respond well to cold, calming creams for instance, and may be hidden with make-up the following day. Avoid sun exposure and self tanning products 3 weeks before and after procedure to prevent any side effects especially scarring or pigmentation. Bleaching creams and products with active ingredients (such as benzoyl peroxide, retinol, salicylic acid) should be stopped 2 weeks prior treatment. Normally, "Microswelling" subsides after 24 hours. Icing the area after can help to subside much of the swelling. Make sure to avoid any exercise where you will be sweating, hot showers and public pools to avoid further skin irritation. As soon as swelling goes down, you can cover any redness using a mineral powder. Always wear an SPF 50 minimum to protect the skin, after any laser treatment. Usually the treatment produces about a week of mild downtime consisting initially of swelling and redness for a few days and then some rough "sandpapery" feeling for a few days as the time laser columns heal. Local redness and warmth appear after the session (normally lasts a few hours). Makeup is authorized 8 hours after treatment, so in case some redness remains, this can easily be masked by a light make-up the next day. We prefer to wait for any redness or marks to vanish completely before treating same area again. The number of sessions actually depends on skin facility to regenerate and on how old the lesion is. Indeed, dramatic results are obtained with thin and recent lesions whereas ancient, large or deep lesions are much more difficult to erase. Nevertheless, each session brings visible reduction of lesions and smoothing of the skin’s surface. Each session provides visible improvement, with reduction of lesions and progressive skin resurfacing. The best results are seen a few weeks later. Thermo-coagulation induces deep restructuring of the skin cells without the lesion (wrinkle, pigment, stretch or scar marks). Fibroblasts are stimulated, collagen synthesis inceases and is thus hydrated, vascular microcirculation improves. Overall, the area treated is more hydrated, more supple. Results are long-lasting due to deep skin cells renewal. We recommend sessions to be at least a month apart. However it is perfectly acceptable to space them further apart, without losing the benefit of previous session (no difference in outcome). When a scar or melasma has been erased thanks to a laser treatment, this result is final, as cells with the issue have been replaced by new ones without the lesion. Wrinkles however may appear after a few years, or new stretch marks in case of another pregnancy for instance, which can all be treated if and when they appear with another round of fractional laser treatments. Approximately 10 days after the treatment, It is recommended to do a microdermabrasion to slough off dead skin cells and get brand new and soft skin. And what happens next ? A fractional laser treatment is long-lasting. Lesions that have disappeared will not return. Of course whilst years go by, new wrinkles may appear, but they will be small, superficial at first, since the laser treatment gained you a few years on normal skin aging process. In case of need, a new laser treatment can be undertaken at a later date, with no risk for your skin.